"Mom! Check out this cool Star Wars base I made. 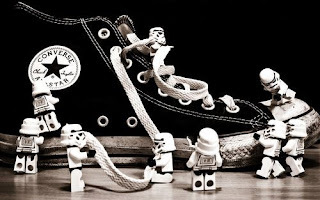 See all the Storm Trooper guys?" "Fire at will! Fire at will! Fire at will... Mom who's Will?" Will is sort of like They. You know, "they" say it's going to rain today. Will has a hard life. Oh dear, Lisa, however did you keep from laughing out loud? I would have, no doubt. Poor Will. And haha to Lisa above for the red shirt joke. Original Star Trek! I'm such a dork. That is simply freaking hilarious. LOL funny!